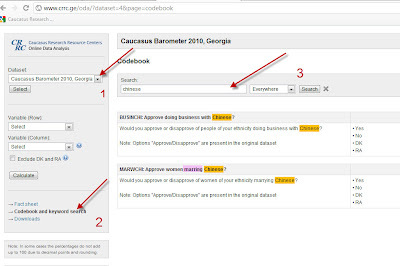 Select the dataset (1), go to Codebook and Keywords (2), and then enter your word (3). In the screenshot here, you already see the results. Note, as highlighted in pink, that we still have occasional typos (marring). These constitute less than 1% of the questions, but yep, the tool is not perfect yet, and you may want to try out different keywords. If you notice a spelling mistake, please leave a comment below. At any rate, keyword search should further expand the usability of our Online Data Analysis for you, which is why we wanted to let you know about it. Try it out by clicking here on ODA.